To get the most out of this class you need to join both the Yahoogroup and the Gathier wicca 101. Combined these will give us our classroom. Yahoogroup will be used for you to ask questions. Your questions can be answered by the moderators, who are the teachers of the class and others in the class can also give their views. Remember the only stupid question is an unasked one. The Gathier group will be used for classroom discussion - both discussion questions on this site and others. No matter how old the thread maybe on a discussion - jump in and we will get it going again. A note on the RE - this is for the revised edition of Bucklands Complete Book of Witchcraft, and if you get a new copy of the book, it will be the one you have. 1. How long does it take to take the course? It should take a year and a day - now you can whiz right through it in a very short period of time, but that would mean you are just reading the assignments. You need to study them, ask questions, and do things they ask you to do. 2. What do I get out the course? Knowledge - and if you did everything and understand it, at the end you can consider yourself a first degree Witch. 3. Is this course just as good as having a "live" teacher? NO - on a course like this you have no one to show you how to do things. Some people need to be shown, others can catch on from just being told how to do something. There are also things that can not be written down. We have added the yahoo group and gathier group to help make it as close as possible to live as we can. But you must work and be part of the discussions, ask questions - be part of the class, not just an onlooker. An onlooker will not get very much from the class. 4. If I join a Coven, will they accept me as a first degree Witch since I completed this course? It would be up to the Coven - some will only except a degrees that they or another Coven in their tradition has given. Others will test you, to see what you know. And still others will take your word. Some of you may want to know the difference between Complete Book of Witchcraft and the Revised Edition of it. The main difference is that there are more illustrations in the RE. If you are buying new - this is the edition you should be getting - but if you have an older edition or buying it used - the information you can get from each is the same. Again be active while taking this. Post to the dragonpalm101 group, answer questions given on the list. Do the exercises in the books when they have them. This is the only way you will learn. Setting in front of your computer screen or just reading the books - will just let you know about Wicca - you must be active to become Wiccan. Some of you may have noticed that this page has shown some changes. 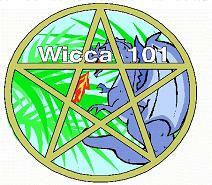 We are in the process of redoing the whole Wicca 101 site. None of the other pages will change until the entire change is done on Dreamweaver's Computer and at that time it will all be uploaded. The basic outline of the course will remain the same. With new webdesign software we hope to be able to improve on the site and make it look nicer and we will expand some of the sections that need it.